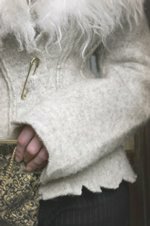 The idea behind Sirri is to utilize the natural resource availabe in the Faroe Islands - to use the Faroese wool and create a product which is unique and which acquires a special significance for the user. Sirri is a brand which only deals with products made out of Faroese wool. Sirri began its activities in 2000 and since then the purpose of our production has been to produce different modern designs created by Faroese and international designers. The international designers have visited Sirri as a part of their design-education. The garments are machine-knitted or woven and then fulled according to traditional methods. This procedure ensures that the garment is wind- and waterresistant while it maintains its soft and warm texture. Our line of products is in constant development as new designs are added regularly. At present we have over 150 different garments to choose from in one or more of the five basic colours of the Faroese wool. Neither the wool nor the garments are dyed, and therefore no two garments from Sirri are identical in colour. Sirri is the invisible tie between man and sheep. When the Faroese shepherd calls 'sirri, sirri, sirri' the sheep come running.